Venkatesh joined SAGE in August 2011 and has a range of sales roles which primarily focus on management and development of the book sales team in India. With experience of around 21 years before joining SAGE, Venkatesh gained sales management experience working for some commercial and university based publishing houses, such as McGraw-Hill, OUP, Elsevier and lastly Springer. 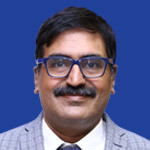 He has a graduate degree on English literature from University of Delhi, a PG Diploma in Sales & Marketing from Bharatiya Vidya Bhavan, Delhi and has also done an accelerated in-campus 2 weeks Executive MBA program from ISB, Hyderabad.